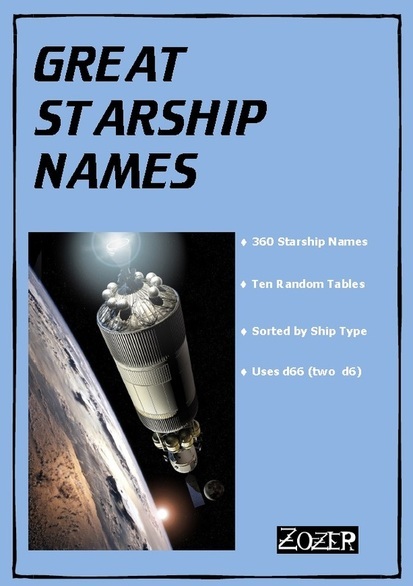 Great Starship Names is a resource for referees and players of sci-fi roleplaying games and wargames. Many scenarios will involve a sudden encounter with a starship, perhaps a military patrol cruiser, a cargo hauler or a scout ship ... naming these ships off-the-cuff can prove problematic. Here we present ten random tables each using d66, that is two six-sided dice, one rolled as ‘tens’ the other as ‘units’. The tables break down ship names neatly into commercial, private or military. Military ship names come in two flavours, traditional’ taking a cue from naval vessels of modern Earth, while ‘epic’ names conjure up the imperial battleships and fighting craft of Warhammer 40K, Dune and Fading Suns. Examples include 'Intrepid' and the 'Sharp Blade of Atonement'. Commercial starship names also come in two flavours, those of the large commercial carriers, the freight liners and passenger ships, as well as the ubiquitous free traders whose naming conventions tend to the unorthodox. Examples include 'Transtar Mobile', 'Olympic Express' and 'Viable Alternative'. Finally we have two tables presenting private starships such as yachts, personal cruisers, interplanetary shuttles and so on. There are several tables from which to choose. A couple of 'traditional' names for military starships, and another if you prefer 'epic' names. A couple more for commercial vessels and then its the turn of privately-owned ships, be they merchants (ethically challenged or otherwise) or wealthy travellers. Use d66 to get a random name or just read down the list and pick one which appeals. A handy work to tuck away against the need for a name in hurry.